Beginning in something is always difficult. Sometimes you really can't pull out any words or images from your usual bag of tricks to start a poem. That's where Magnetic Poetry kits can help you out. About 200 words are packed together under a certain theme to guide you about the subjects, tones, and metaphors of the poem you will create. 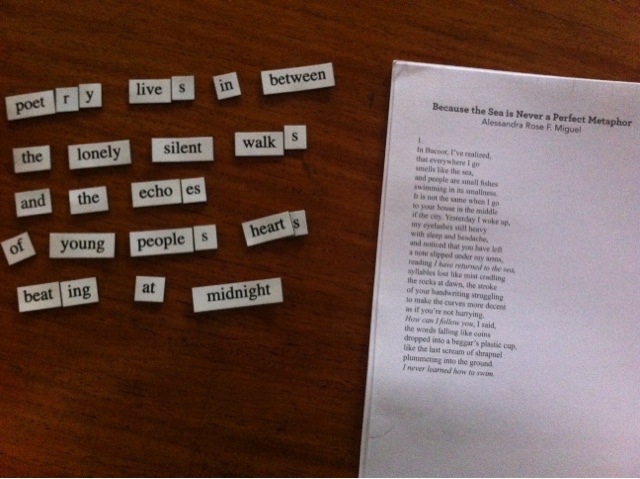 Last Christmas, I was given two Magnetic Poetry kits, particularly the Edgar Allan Poet and New York sets, which I often use when I'm out of ideas and I badly need to get rid of my writer's block. It's like a warm-up routine for the mind. Cynics and narcissists will take pleasure in the Edgar Allan Poet kit. The words in the set truly embody Poe's style that clutches on the mysterious and emotional side of things. It helps in constructing a narrative that is dark with a slow-paced tone and unavoidable imagery. With the words amontillado, wine, and raven, you can easily associate the set to the writer. One might think that the abundance of words that may seem lonely, pessimistic, and with apocalyptic undertones can only create negatively powered messages and images. But the set also has some of the strongest words of hope like imagination, dream, and live. Every night I stare before the street that separated us. His dreams are half empty. As I see his bones ravened by life's storms. The New York set contains so many pronouns, like the names of the famous landmarks and destinations of the city that never sleeps, which gives off something more concrete (which can be literal) and visual. You are most likely to create a scene from 'The Devil Wears Prada' with this set. If you want to get your friends hooked into poetry magnets, this is probably a safe set to start with. Between the two, this kit's theme, in my opinion, is more capable in the style of storytelling, as it immediately provides a setting. It's also more fun to play around the words since it's usually encountered in daily conversations. It has words like eat, kiss, art, fashion, traffic, and more that can describe the culture of any city. But how does one add artistic flare in easily encountered words and imagined corners? By giving it new metaphors that aren't necessarily limited to the Big Apple, but to different city realities and experiences. 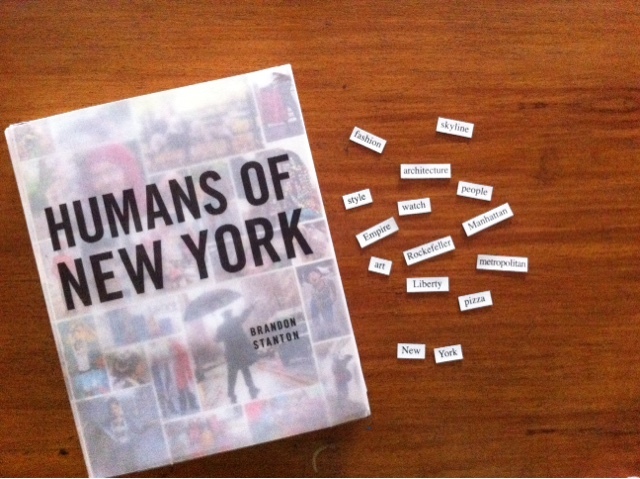 I usually consult my Humans of New York book to be able to work with different poetic voices when using this set. It reminds me of the eccentricity and diversity of characters of the city that gives way to so many possibilities to help in describing and making an anecdote through poetry, and through the words on the magnets. The sets actually make it easy and challenging for poetry beginners. Words are flat out given to you. The tricky part is choosing which ones to stitch together. You can start by picking out which words interest you out of all the others. From that pile, seeing about two or three words will make your mind start creating phrases and ideas in your head -- usually it's cliche, but that's okay. And sometimes you'll find that some words are missing and you'd have to find a way to create a phrase that would let you say the same thing. Or, you'd have to work with a new thought altogether. It's also okay to discard everything you've already put together. 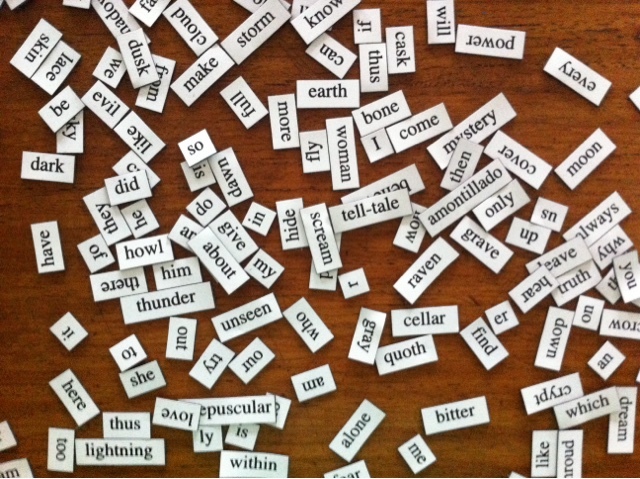 Like traditional writing, there's also a process of editing when you play with your poetry magnets. The kits give you direction and just enough space to test your creativity and love for words. It's challenging to be bounded by only a few words, but boundaries don't always mean stagnation. There are always ways to discover and define what the given words mean. These themed kits are really hard to come by here in the Philippines, but you can easily get your own sets from Magnetic Poetry MNL (http://magneticpoetrymnl.com)! Same poetic fun made local!